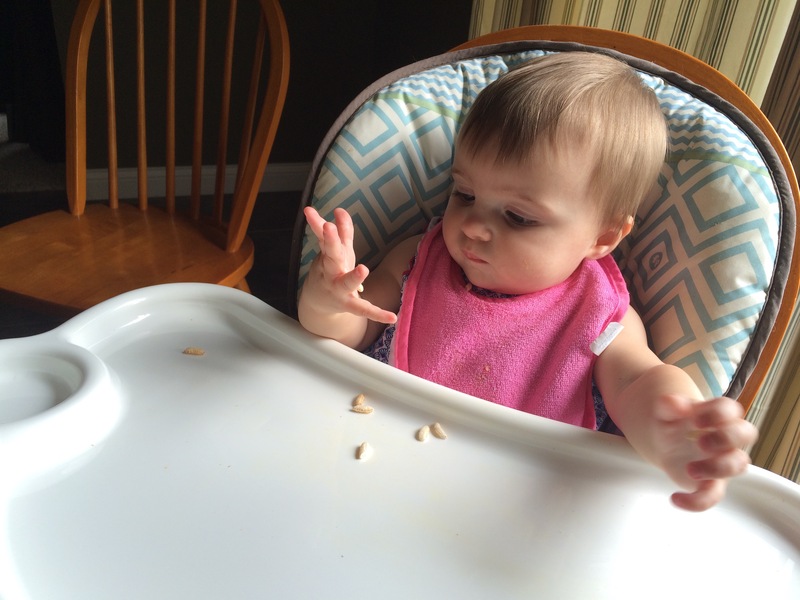 In the last four months A went from baby to full-blown, running, talking toddler. In that time her preferences changed a lot. When she was about 6 months old, she decided she didn’t love pacifiers, but now we have to put about five in her crib every night. Right after A started walking, we moved to a new house with stairs. We tried several baby gates without luck, so instead we have focused on monitoring her and teaching her how to properly and safely go up and down stairs. <KidKusion Hearth Cushion, Taupe We have a fireplace that has hearth about a foot off the floor. To protect A as she started learning to really climb, we added this. We really appreciated the velcro when she tried to pull it up recently! KidCo Universal Outlet Cover 3 Pack – White We received a few of these as gifts at our baby shower and loved them so much we bought enough for most of the outlets in the house. A bit more expensive than the traditional outlet covers, but much more practical. A particularly likes table food. We still use the Plum Organics Stage 2, Organic Baby Food, Fruit and Veggie Variety Pack, 4 ounce pouch (Pack of 18) and Sprout pouches, but she pretty quickly liked food she could pick up on her own (peas, corn, cooked carrots, etc.). We still use Advil Infants’, Baby Banana Brush Bendable Infant Teething & Toddler Training Toothbrush and the Hyland’s Baby Oral Pain Relief Tablets quite a bit. Molars are just awful for everyone. VTech Sit-to-Stand Learning Walker was wonderful when she was learning to walk. Now, she rarely plays with it. Munchkin 5 Sea Squirts Baby Bath Toys makes washing her hair so much easier! 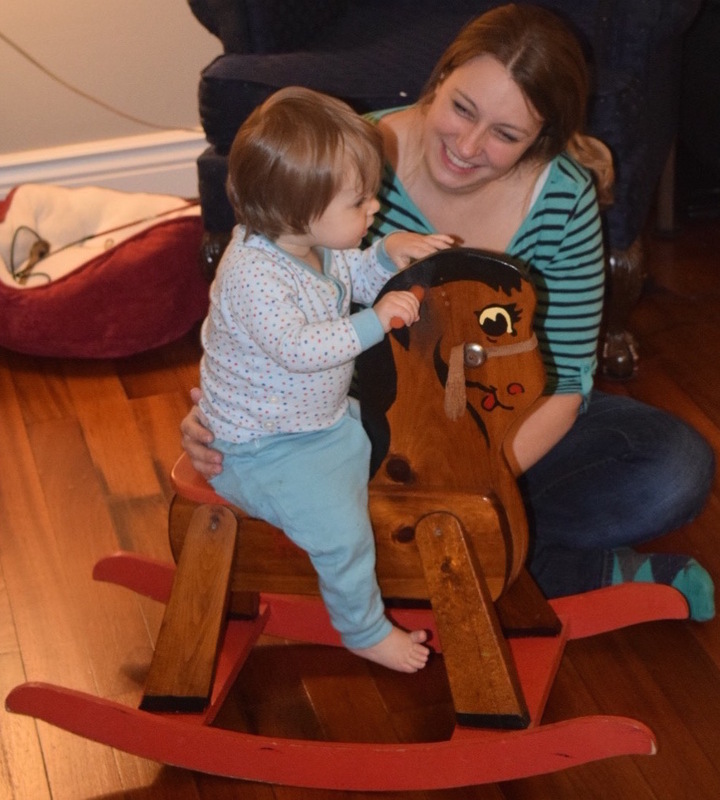 Antique rocking horse my grandfather made for me when I was A’s age! The tupperware cabinet is her most favorite kitchen cabinet. Her second is the pots and pans. Bubbles. There is nothing that makes her calm down as fast as blowing some bubbles. Bonus: if you blow bubbles in the kitchen, it can count as mopping the floor! Boxes empty cardboard boxes of all sizes and shapes. Desitin This is the only thing that cleared up a particularly recent rough diaper rash. Don’t worry about the scent, you get used to it! Baking soda baths. When her diaper rash started getting out of control, we started giving her a bath with about a tablespoon of baking soda in it, which seemed to help. The only catch is remembering there is baking soda in the bath and not using bath water to rinse her hair! CribWrap Crib Wrap 3PC Rail Cover Set By Trend Lab – 1- 51″ Front Rail Cover, 2- 27″ Side Rail Covers, Gray Fleece with teeth came a lot of chewing. A enjoyed chewing on her crib rails. Before that became an issue, I got these and they were worth every penny. We have one of the two needed (one for each car) Graco My Ride 65 LX Convertible Car Seat, Coda car seats, as A is starting to be too tall for the bucket seats. Our Ingenuity Smart and Simple Playard™- Brighton™ quickly became a place where she was only happy for a few minutes at a time. Even the addition of ball pit balls after her first birthday only keeps her happy for about 10 minutes. As if the playard wasn’t awful enough, woe is to anyone who tries to put A in her Neighborhood Friends Activity Jumper . She is much too big for that now.